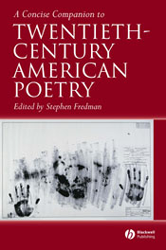 This Concise Companion gives readers a rich sense of how the poetry produced in the United States during the twentieth century is connected to the country's intellectual life more broadly. This book helps readers to fully appreciate the poetry of the period by tracing its historical and cultural contexts. It is written by prominent specialists in the field. It places the poetry of the period within contexts such as: war; feminism and the female poet; poetries of immigration and migration; communism and anti-communism; philosophy and theory. And each chapter ranges across the entire century, comparing poets from one part of the century to those of another.